That realization was actually a positive because it showed us the new Jay Powell, the Powell who spoke publicly at the Washington Economic Club. Holger Zschaepitz‏ @Schuldensuehner – If Fed continues quantitative tightening, not only will $200bn in liquidity vaporize every 4mths but de facto tightening will amount to 1 hike a quarter; fin conditions will tighten as if Fed had maintained “gradual” rate tightening pace, Quill Intellígence’ @DiMartinoBooth says. That makes sense but is there a more quantitative measure of the impact of QT? Yes. Bloomberg reports that Morgan Stanley analysts have built a quantitative model to measure the impact of QT on the stock market. 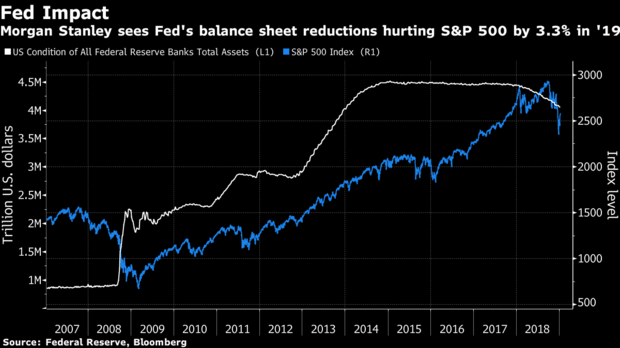 The S&P 500 has shown a positive relationship to central bank action on mortgage backed securities since 2009, with every $20 billion shift in bond holdings equaling a 0.37 percent change in stock prices, strategists led by Brian Hayes found. Should the Fed continue to its pace of $15 billion in reductions a month in 2019, the gauge would drop 3.3 percent, the model shows. That’s roughly a third of its annualized return in the past five years. This is what Gundlach has termed a “suicide policy”. That may be too harsh but there is no doubt this double barrel liquidity squeeze will put an upward pressure on Treasury yields. That is what we saw this week. So, despite the sharp fall in yields on Friday after the negative inflation number, the 30-year yield rose by 6 bps on the week & the 2-3 year Treasury yields rose by 4 bps. This did eliminate the 1yr-7 yr inversion but the 1-5 year curve remained inverted at the end of the week. But this is only in Treasuries, especially in long maturity Treasuries. Compare the performance of TLT to that of PNF, a leveraged NY Muni Closed End Fund so far in 2019. Yes, PNF is up 7.93% so far in January and yields 5.42% (triple tax exempt) after the rally. Nothing new here, folks. Standard operating procedure is to buy leveraged Muni closed end bond funds AS Fed tightening starts getting priced out of the system. David Rosenberg‏ @EconguyRosie – Jan 8 – Our cyclical S&P 500 index peak-to-trough drawdown of 22% flashed a two-in-three recession probability. 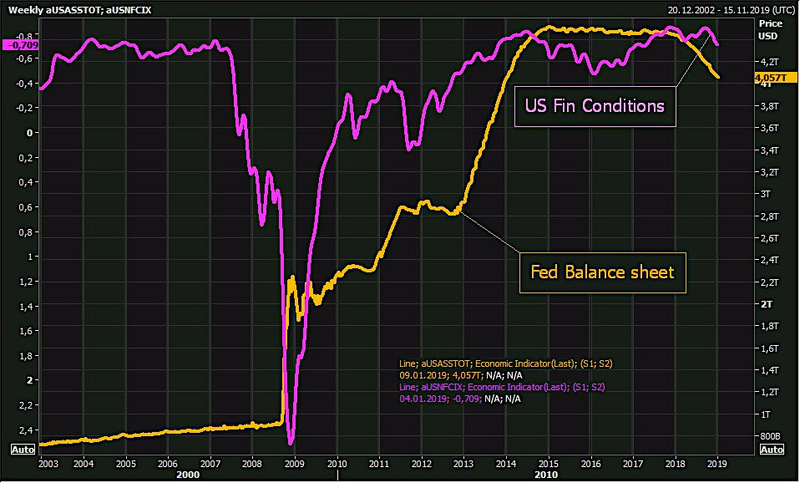 The only times the economy failed to contract in the aftermath was because the Fed eased policy outright. David Rosenberg‏ @EconguyRosie – Jan 10 – Germany in a recession is a pretty big deal. Largest economy in Europe, accounting for one-third of industrial activity, and fourth biggest GDP on the planet. No such thing as global decoupling. That leaves the big question. Has the Powell Fed retained enough “residual hawkishness” to resist cutting interest rates? 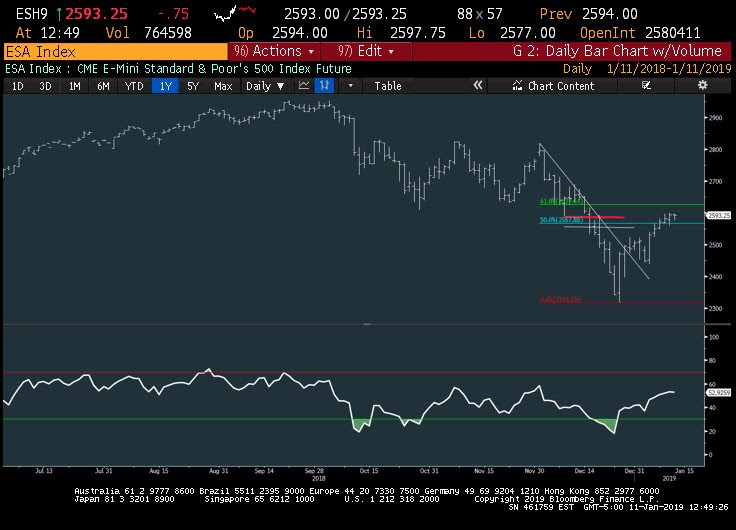 If so, will we see the old pattern repeating – a stock rally & increased Treasury issuance forces interest rates back up which in turn weakens the interest rate sensitive sectors of the economy that causes a stock selloff. But what about arm chair commentators on Fin TV who profess smugly that the Fed should stand firm against markets & focus on the economy. And not just households. The exposure of corporations to interest rates is also very high. Guess the arm chair TV talkers don’t understand how leveraged the US economy is. The Powell Fed does understand this even though many on Fin TV don’t. But understanding this may not be enough. They have a big big obstacle to overcome – the institutional credibility of the Fed. In the interests of maintaining this institutional credibility, the Powell Fed might choose to make haste slowly and follow the data instead of preemptively cutting rates to stop the slowdown. Don’t we have anything positive to say? We do, in the first part of the next section via indicators with a good track record. First the longer term positive indicators, at least based on past history. 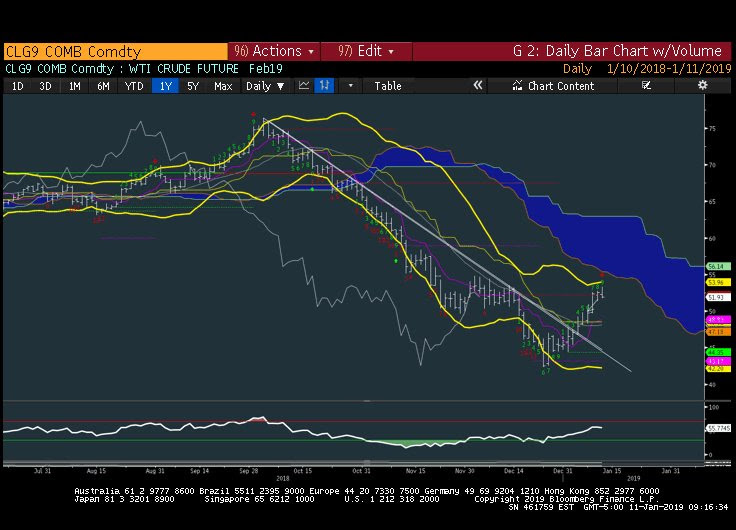 Ryan Detrick, CMT‏ @RyanDetrick – Jan 8 – The last time the McClellan Oscillator went from -80 (super oversold) to +80 (super overbought) within two weeks? March 2009. It just happened yesterday. And how rare is this indicator? It has occurred only 11 times in the last 40 years, according to @ukarlewitz . Urban Carmel‏ @ukarlewitz – $SPX pausing right where many thought it would. Exiting out of the top of the green zone would be noteworthy. But is volatility sending a message? Bob Lang‏ @aztecs99 – Jan 9 – vix down sharply this week, TRIN at .60, oscillators swelled…hard to keep this going. suspect down coming shortly. Douglas Kass‏Verified account @DougKass – Jan 9 – …. 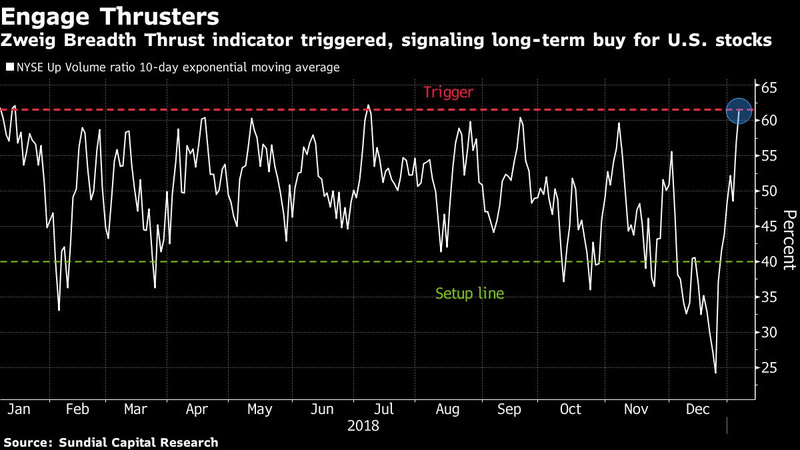 I anticipate the trading range, as most are aware, will ultimately be broken to the downside in response to a sharp deceleration in the rate of global growth and a meaingful miss to corporate profits. We won’t have to wait long to find out whether corporate profits exceed or miss already reduced forecasts. How the stock market reacts to profits will tell us more than all of the above stuff. 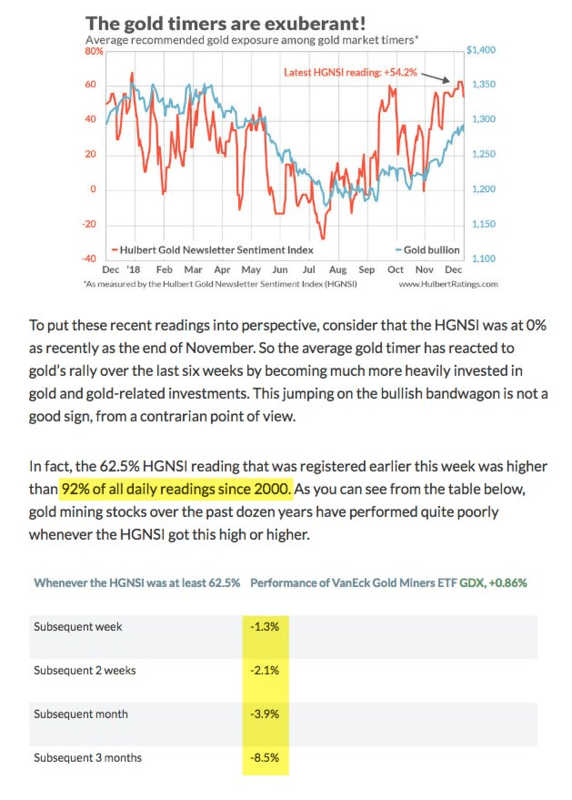 What about Gold, you ask!